Exercise for women with uncomplicated pregnancies is strongly encouraged. Exercise comes with minimal risk and great benefit. Sedentary women before pregnancy should follow a more gradual progression of exercise, and is often times not recommended to begin a new or more intensified workout program in the first trimester without talking with your doctor, or health care provider. Changes to a workout/exercise program are better kept for the second trimester. Reduced risk of low back pain. Reduced risk of gestational diabetes. Reduced incidence of incontinence and pregnancy constipation. It is important to recognize that your body is going through great changes, and this will require changes in your routine and intensity. Some things to consider when exercising during pregnancy are your changing weight, a shift in your center of gravity due to your growing belly, and hormonal changes such as an increase in the hormone relaxin. Relaxin is a hormone produced by the ovaries and placenta, during pregnancy to assist in preparation for childbirth, by relaxing ligaments in the pelvis and softens/widens the cervix. However, this hormone is not just site-specific, meaning its effects can extend beyond the pelvis. As such, regular exercise can help muscles stay active and strong to help provide joint protection to the entire body! Generally safe activities and exercises include those with a low risk of falling, and those that can be done at a comfortable moderate intensity. Contact or high impact sports such as basketball, hockey, soccer, and volleyball should be avoided, to help protect trauma to your belly and pelvis, and reduce change of excess stress on other organs. Activities including scuba diving, water sports, yoga poses such as lying on your back or lying on your stomach after the first trimester need to be put on hold until after your pregnancy. Remember, these are general guidelines, and your pre-pregnancy activity level and health care provider’s advice will dictate how much is safe for you! We are all different! Speak with your health care provider, or seek advice and consultation from a physiotherapist, as details from your pregnancy and delivery, will often dictate when and how it is safe to resume previous activity levels and sports/hobbies. 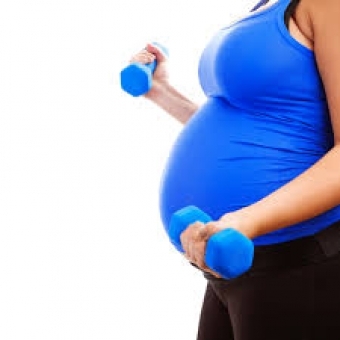 If you plan on have subsequent pregnancies, starting an exercise program in advance will increase your physical activity level and support throughout your pregnancy, as often times multiple childbirths are known to lead to increased risk of issues (earlier onset back or joint pain, ‘showing’ earlier, etc.). 2. Shi W et al. Epidemiology and risk factors of functional constipation in pregnant women. PloS one 2015;10(7):e0133521. 4. Sanabria‐Martínez G et al. Effectiveness of physical activity interventions on preventing gestational diabetes mellitus and excessive maternal weight gain: a meta‐analysis. BJOG 2015;122(9):1167-74. 5. Price BB et al. Exercise in pregnancy: effect on fitness and obstetric outcomes-a randomized trial. Med Sci Sports Exerc 2012;44(12):2263-9. 6. Domenjoz I et al. Effect of physical activity during pregnancy on mode of delivery. Am J Obstet Gynecol 2014;211(4):401.e1-e11. 7. Robledo-Colonia AF et al. Aerobic exercise training during pregnancy reduces depressive symptoms in nulliparous women: a randomised trial. J Physiother 2012;58(1):9-15. 8. Perales M et al. Benefits of aerobic or resistance training during pregnancy on maternal health and perinatal outcomes: A systematic review. Early Hum Dev 2016;94:43-8.